It's the end of the month and it's time to bring out the proper poor curry recipe.This recipe is vegetarian, dairy and gluten free and costs about £1.50 a head. My husband always goes 'eurghfm' when I tell him i'm making it but he always goes 'this is amazing' when he's eating it! For the rice; 2 handfuls of rice per person 1 tspn of fennel seeds Enough water to cover rice and above by 2"
A Response About My Holey Bread! 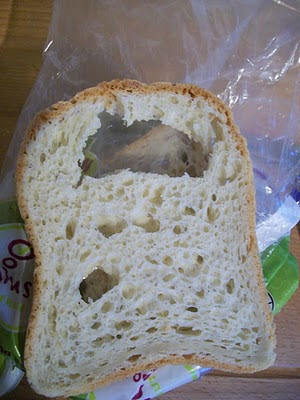 Thank you for taking the time to email us about the recent problem you have had with your Genius loaf. We are very sorry to see from the attached images that the white sliced loaf you purchased was obviously not up to the standards that we expect. If you still have the best before date of this particular loaf could you please let us know as this helps us to work out when it was produced so that we can pass the details on to the bakery to investigate? We'll take this matter up with our production manager as the quality of our products and the satisfaction of our customers are extremely important to us. Please send us your details so that we may respond to you formally in writing regarding the poor quality loaf you have received and will enclose a voucher to reimburse you. We would once again like to offer our sincere apologies and we hope that this experience will not discourage you from choosing Genius bread again in the future. Let's see what they say to my email of complaint. I was at the NEC in Birmingham for 5 days recently working as an exhibitor at a trade fair. It's something I do every year with my job and I usually really struggle to find anything to eat at lunchtime.I've tried bringing my own lunches but when you're staying in a hotel all week with no fridge, your options are limited. This year I was pleased as punch to be taking along a loaf of Genius bread as I knew it wouldn't disintegrate on the journey like the bread I took last year. I also took along tins of tuna and mayo or tuna and red beans with ring-pulls, a pack of GF pretzels and dairy free cartons of milkshake. I actually found these at the Marks and Spencer in Birmingham New Street train station. That little shop actually had a wheat free unsliced brown loaf, a lemon sponge cake, a frangipan cake and these. Pretty amazing. The baps themselves are great. They hold together nicely and have a nice flavour. If anything they could have a bit more flavour. Given the quantity of delicious sounding ingredients on the back, they are slightly bland. They have an odd shape, almost pyramid like. I found I had to slice them into 3 parts to fit into the toaster. But overall, I can't complain. Reasonably priced, soft and easy to slice these baps are the nads. Nothing much to say except, brilliant! Great bread, great filling, fab flavour. Next time I'll try to head there a bit earlier and get the ham salad version and hopefully, due to their apparent popularity, M&S will add new fillings soon! List of M&S shops selling Gluten Free sandwiches.